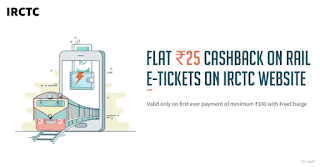 Freecharge IRCTC Offer, Freecharge Get Rs.25 Cashback on Railway Ticket Booking on IRCTC Website – After long time Freecharge is come up with some interesting offer. Today we shared Frecharge 100% Cashback Offer. Now another cashback offer. 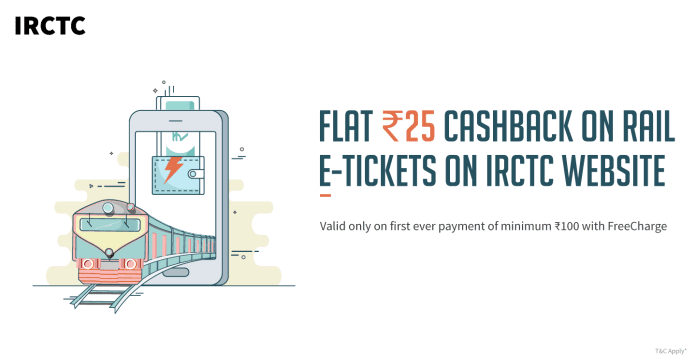 Freecharge is offering Flat Rs.25 Cashback on Train Ticket Booking on IRCTC Website. This is Freecharge IRCTC Offer. Offer is valid for all users. Just Book Railway Ticket via IRCTC & Pay amount via Freecharge to Get Rs.25 Free Cashback. First Load Money in Freecharge wallet. Book your Train Ticket (Minimum Train Ticket Booking Amount is Rs.100). Complete the Payment via Freecharge wallet. Finally you will get free Rs.25 cashback.